The horse (Equus ferus caballus) is one of the most useful and beloved of God’s wonderful creatures. Even in the rocket age there are approximately 60 million horses in the world. In America, horses are a $39 billion industry that employs 4.6 million people. Humans have been interacting with horses since creation. They are used for transportation, work, sport, pleasure, meat (eaten by the French), milk, leather, pharmaceuticals, and other things. Historically, horses were used extensively in warfare. During World War II, an estimated 6 million horses were employed. Even in the age of mechanization, horses are still widely used in agriculture and police work. The lifestyle of many groups of people was inseparable from the horse. These include Arabian nomads, North America Indians, the Mongols, and the Huns. In fact, man’s use of the horse is so extensive that there is a vast specialized vocabulary for describing everything from its anatomy and behavior to its color and markings. An extensive variety of riding styles, driving techniques, and equipment have been developed. There are more than 300 breeds of horses today. They are loosely divided into three categories based on general temperament: “spirited HOT BLOODS with speed and endurance; COLD BLOODS, such as draft horses and some ponies, suitable for slow, heavy work; and WARMBLOODS, developed from crosses between hot bloods and cold bloods, often focusing on creating breeds for specific riding purposes, particularly in Europe” (“Horse,” Wikipedia). Arabian: It gets its name from the Arabian Peninsula. Known for its endurance, the Arabian is capable of running over 100 miles without rest. Quarter horse: The American quarter horse is the world’s most popular breed; it is the fastest horse over short distances; it is the “cowboy horse,” used for roping and cutting, barrel racing, and hunting. Tennessee Walker: A horse developed in the Southern United States in the 18th century for use on farms and plantations. It was widely used by Civil War officers because of its endurance and smooth gait that makes it comfortable for riding long distances. Robert E. Lee’s Traveler was part Tennessee Walker. Morgan: The Morgan was developed in the United States as an all-around saddle/stock horse for farming and ranching, harness racing, and pulling carriages. They are still used widely in rodeo work. Paint: This is a combination of the conformation of a western stock horse and the colors of a pinto. Miniature Horse: Developed in Europe in the 1600s, the miniature horse must be under 38 inches. Andalusian: A Spanish breed developed in the 15th century, it was used as a war horse. Most of them are grey or bay. The horse’s normal life expectancy is 25-30 years. The oldest on record was “Old Billy,” which lived to the age of 62 (died in 1822). More recently the pony Sugar Puff died in 2007 at age 56. The height of a horse is measured at the highest point of the withers, where the neck meets the back. It is measured in units of hands and inches. One hand is equal to 4 inches. For example, 14.2 is 14 hands and 2 inches or 58 inches. A pony is a horse that is less than 14.2 hands high. The largest horse on record was a Shire named Sampson (also known as Mammoth) that stood 21.2 hands (86 inches) and weighted 3,360 pounds (1,524k). The smallest horse on record was Einstein, a 14-inch tall pony. When a horse is galloping, all four hooves are off the ground at one point. This was proposed in 1872 by Leland Stanford, and it was proven to be correct by Eudweard Muybridge, who used an array of 24 cameras to photograph a racehorse named Sallie Gardner. 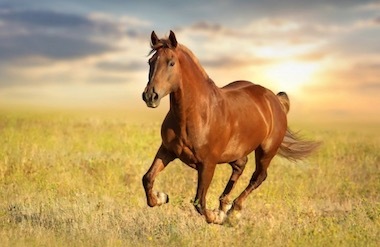 The fastest horse on record could run 55 miles per hour (88 kph). The longest jump over water was by Something, which jumped 27 feet 6 inches. The highest jump was made by Huaso, which jumped 8 feet 1 inch. The horse has keen senses. Its eyes are the largest of any land mammal. It has a range of vision of 350 degrees and excellent night vision. A horse can look at two different things at one time, and its ears will point in those different directions. The horse’s sense of smell is aided by two olfactory systems, one in the nostrils and one under the nasal cavity. These organs have separate nerve pathways to the brain to analyze different kinds of smells, including pheromones (chemicals excreted by animals and insects to trigger social responses). The horse’s hearing is very keen. It can detect sounds as far as 2.5 miles (4 km). Its hearing covers a wider range of frequency than a human’s (14 Hz to 25 kHz vs. 20 Hz to 20 kHz). Its outer ears (the pinnas) are capable of rotating 180 degrees for isolating sounds and sensing direction. The conical shape of the pinna acts to capture sound as well as to shield the sound from other noises. They can also pick up low frequency vibrations through their hooves and teeth. The underside of a horse’s hoof has a triangular shaped area called the “frog,” a brilliantly-designed organ that acts as a shock absorber as well as helping to pump blood back up the leg. The horse’s brain is about half the size of a human’s, but its heart is about 10 times the size of a human’s. A human heart weighs about 11 ounces and is the size of a clenched fist, whereas the horse’s weighs 9 to 10 pounds and is the size of a basketball. The horse is a social creature that typically lives in herds of 3 to 20, usually led by a stallion. A single horse will get lonely. A horse’s teeth are a good indicator of its age. The saying, “Never look a gift horse in the mouth” means don’t carefully examine a gift. The horse’s memory might be even better than that of an elephant. Horses love water and will drink a minimum of 25 gallons per day. It will eat 1 to 2 percent of its body weight every day. When a horse looks like it is laughing, it is actually engaged in a technique to enhance its smelling. One horse can produce 15 to 30 pounds of manure daily. “In 1900, there were 15,000 horses in New York City. They produced enough manure in one year to create a pile 175 feet high, covering an acre of land, and breeding 16 billion flies” (Joel Tarr, “Urban Pollution,” American Heritage Magazine, Oct. 1971). Horses can sleep both standing up and lying down. When standing, it locks its leg joints. If they are in a group, at least one horse will stay awake as as a lookout. Horses can breed with zebras and the product is called a zebroid. A cross between a zebra and a pony is a zony. The horse is mentioned 213 times in the Bible. The first mention is in Egypt during Joseph’s reign (Ge. 47:17). The Bible speaks of the horse’s strength and bravery (Job 39:19-25; Jer. 47:3), stubbornness (Ps. 32:9; Pr. 26:3), ability to find its way through a wilderness (Isa. 63:13), stamina (Jer. 12:5), swiftness (Jer. 4:13; Hab. 1:8), ferocity (Hab. 1:8), even the stallion’s passion for the mare (Jer. 5:8). The horse is often mentioned in the context of war. The Bible describes vast armies with massive numbers of horses and chariots, beginning with Pharaoh’s horsemen (Ex. 14:9). Joshua defeated a coalition of Canaanites “with horses and chariots very much” (Jos. 11:3-4). David defeated an army of 20,000 that was accompanied by 1,000 chariots and 700 horsemen near the river Euphrates (2 Sa. 8:3-4). The Bible describes horse warfare in dramatic terms. It mentions the snorting (Jer. 8:16), the stamping of the hooves (Jer. 47:3), the rushing into the battle (Jer. 8:6), the dust (Eze. 26:10), the pransing (Na. 3:2). Israel’s kings were forbidden by the law of Moses to multiply horses, which is a reference to war horses from Egypt (De. 17:16). This was intended to keep Israel from trusting in horses and chariots like other nations. Compare Ps. 20:7; 33:17; Isa. 31:1. In disobedience to God’s command, Solomon had 40,000 stalls of horses for his chariots and 12,000 horsemen (1 Ki. 4:26). One of the gates of Jerusalem was named the horse gate (Ne. 3:28). The Assyrian horsemen were clothed with blue (Eze. 23:6). Horses will be used in end-time battles. Gog and Magog will ride horses (Eze. 38:4, 15; 39:20), and horses will be at the battle of Armageddon (Hag. 2:22; Zec. 12:4; Re. 14:20; 19:18-19). The opening judgments of the Tribulation are described under the metaphor of horses (Rev. 6:2, 4, 5, 8). Horses are mentioned in connection with Christ’s kingdom. Converted Jews will be brought to Israel on horses (Isa. 66:20). Kings and princes will enter the gates of Jerusalem on horses (Jer. 17:25). There are heavenly horses that are more amazing than the earthly horses. Elijah was taken to heaven in a chariot of fire, and horses of fire (2 Ki. 2:11), and Elisha saw horses and chariots of fire in the mountains around Dothan (2 Ki. 6:17). Christ will come from heaven on a white horse accompanied by the armies of heaven on white horses (Re. 19:11, 14).